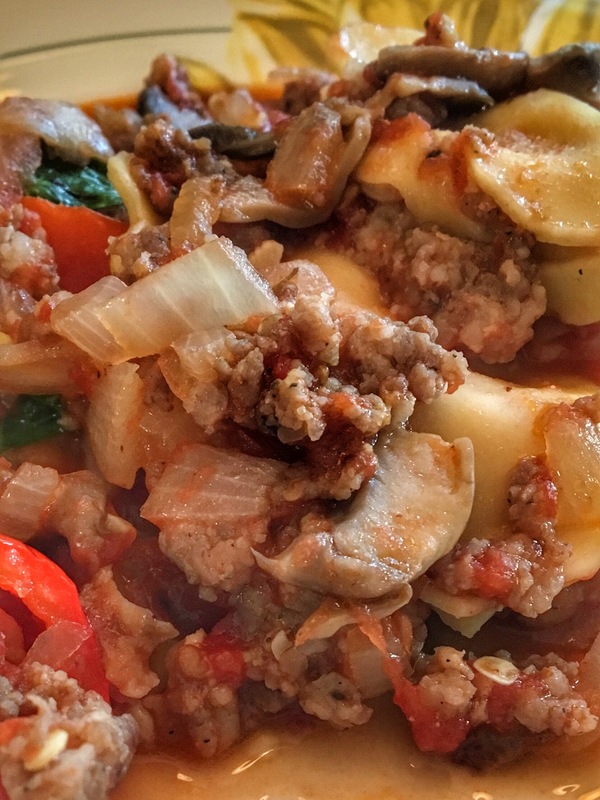 When you need your Italian fix and can’t stomach another plate of mediocre spaghetti – sausage ravioli! This one dish dinner starts with chopped garlic and onion, which I was happy to discover cook just fine on their own – no need to douse them in oil. The addition of bell peppers cooked to crisp tender and hearty sautéed mushrooms give the sauce a veggie rich base, making it all the more filling. It also makes a gracious plenty – more than enough to freeze for a second supper! Stretching the family grocery budget into next week, and setting us up for at least one night with a home cooked meal that no one has to cook. Saute onions and garlic, adding bell peppers and mushrooms until cooked through. Add sausage, cooking until browned. Add tomatoes and simmer for 15 minutes. Add ravioli and cook on high heat for 5 minutes. Serve with fresh basil and shaved parm. MFP entry: Sausage Ravioli, 1 cup serving, 416 cals.